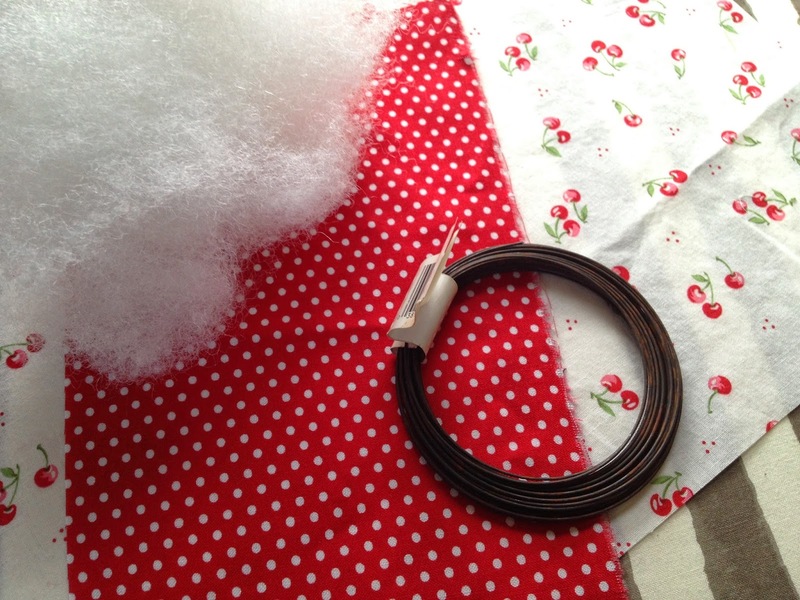 To Stephanie C. whose Travel Cord Wrap idea won the 5th Annual Customer Design Contest. I will be working with Stephanie the next few weeks, developing a prototype and picking some fun fabrics and then it will be available in the shop for purchase! Stephanie will receive one for free AND one other fan will receive a free one so stay tuned for details! 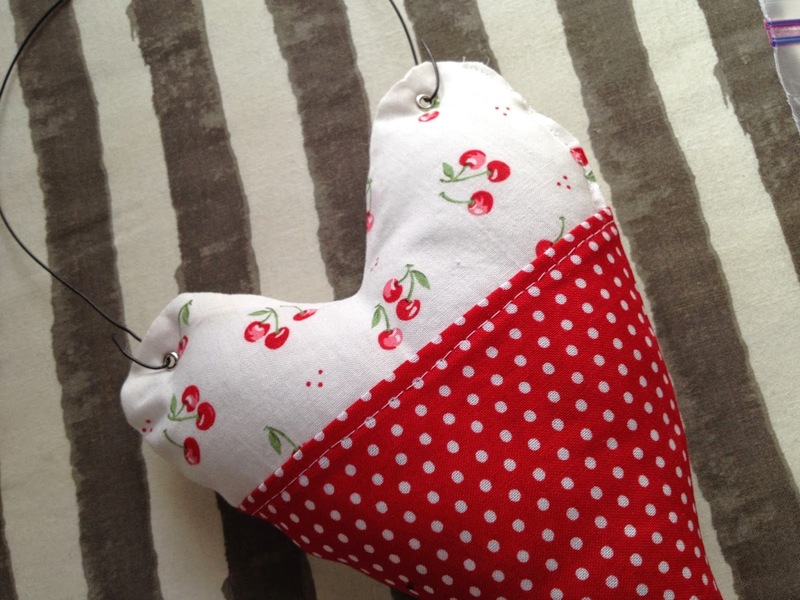 This cute heart door hanger is the perfect size for leaving a small treat for your Valentine, give a present to your child's teacher or make as part of your Valentine holiday decor. You can make it with or without the hanger, use them as bowl fillers, sit one or more up on a shelf, lean it against some throw pillows...wherever you'd like to tuck in a little love. Below is a tutorial for making one, and a link to the paper pattern if you don't want to draw one for yourself. -Craft wire, if you like, or pretty ribbon, or pearl cotton - anything you want to use for the hanger if you're making one. Craft wire holds the shape best obviously, but if you don't also have wire cutters, and small grommets...you might want to use something else. -other basic sewing supplies, pins, sharp scissors, a gauge or ruler, iron and ironing board, thread, etc. Start with the pocket piece. Place it right-side down on the ironing board, with one of the short sides at the top. 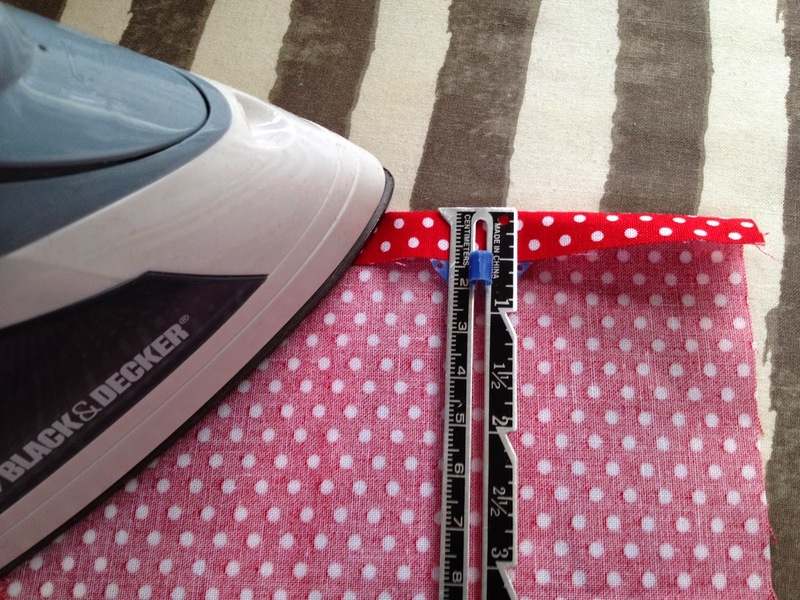 Using a gauge or ruler, fold the top edge down 1/2" and iron as seen in the picture. Then, open the crease you just made, and tuck the raw edge up to the ironed crease. Hold it in place with your finger, and iron again. Stitch your hemmed edge down, close to the lower fold. If you want to sew from the backside, so you're sure you catch the hem, that's totally fine. Take the larger, 10X16 piece and fold it, right sides of the fabric together, so that you now have a 10" tall by 8" wide rectangle. 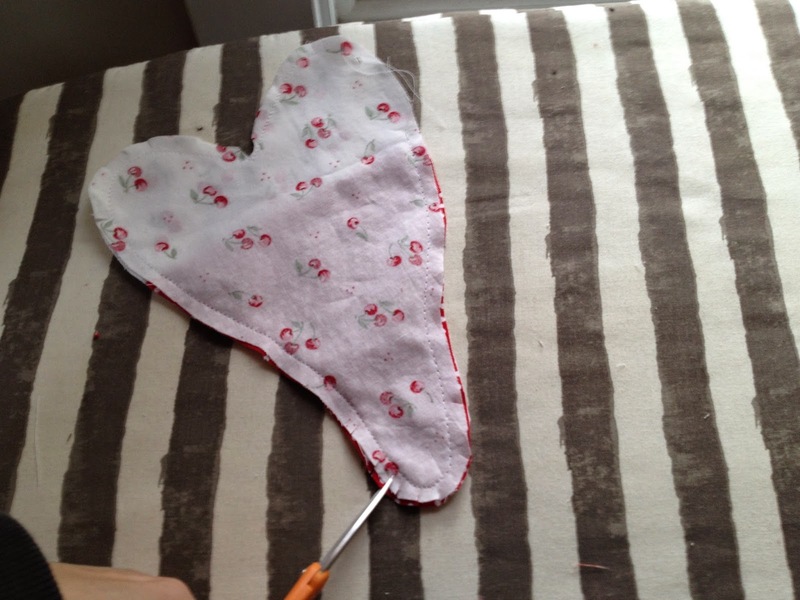 Keeping the fabric folded, draw a large (larger than you want it to be when it's finished) heart. You can make a symmetrical heart...or I did an oblong one with a little quirk to it. I drew it out on card stock first and cut it out then traced around it with my disappearing ink fabric marker. Don't want to draw one yourself? The pattern piece is available as a PDF here in my Etsy shop. 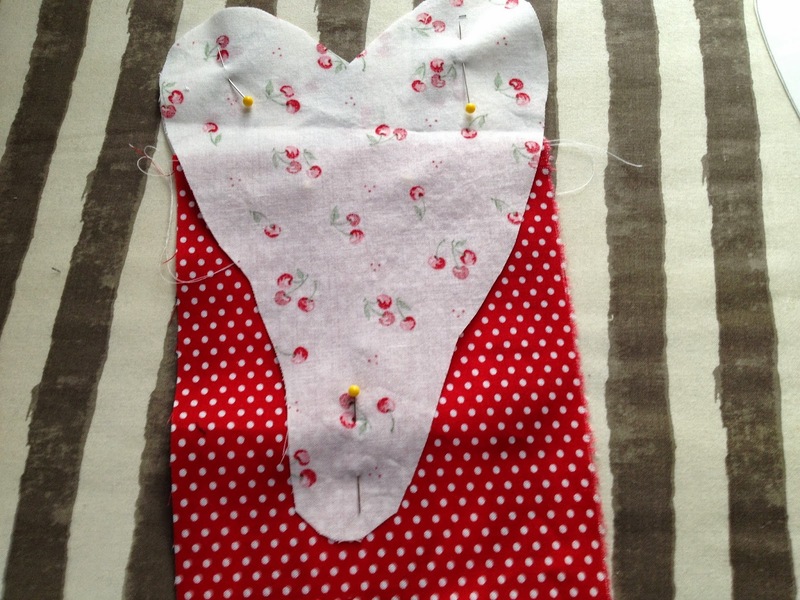 Once you've traced the heart, keep the fabric folded and cut along the traced lines. You'll have two hearts. Decide which heart half you like best as the front. Lay it down in front of you with the right side of the fabric facing up. Lay the pocket piece on top of it, about 1/3 of the way down, right side up. 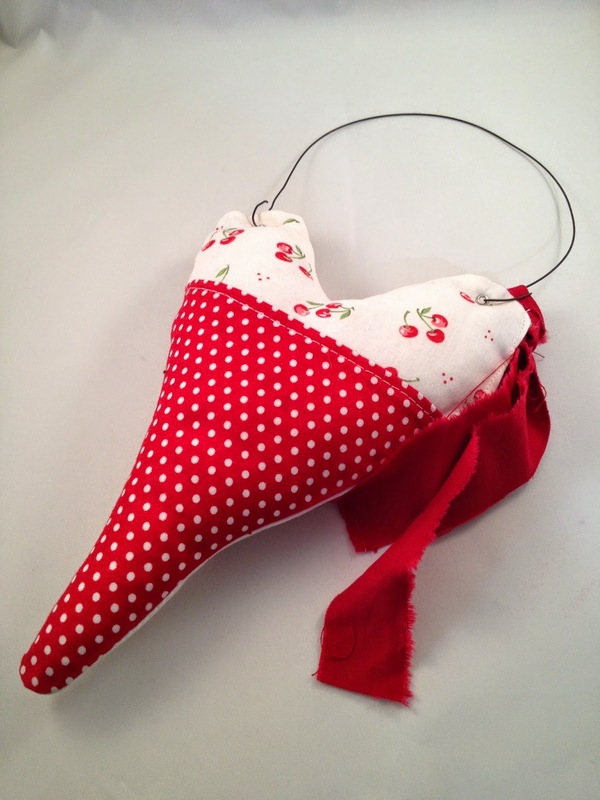 The side edges of the pocket need to cover the side edges of the heart. The hemmed edge of the pocket should be at the top. See in my picture how the entire bottom 2/3 of my heart is covered? Then pin the pocket in place. Lay the back of the heart, right side down on top of the pocket. Line up all your edges and pin. You will have a pocket sandwich. You can sew it this way, but if you feel more comfortable, you can also trim away the excess pocket pieces that stick out beyond the heart edges. Your call. Leave a 1" - 1 1/2" opening near the top, and stitch all the way around the heart, using a 1/4" seam. In my picture here, I left the opening on the top right side, where it's most straight, and not part of the pocket. Clip the curves of the heart, and the bottom. Very carefully, cut close to the "V" in the center of the heart. On all these cuts, make sure you don't cut through any of your stitches. Through the opening you left, pull the heart around to the right side. Push out all your curves, and press. Using the opening again, fill the heart with fiberfill to desired stuff-ness. Now you can either hand-stitch or machine-stitch your opening closed. If you are not going to hang your heart, you're done! If you choose to hang the heart, you can use a needle and decorative thread or thin ribbon to push through the top two curves of the heart. Tie a knot in each end and you're done. I used craft wire and small grommets. If you choose to do the same, start a hole with a thicker hand-sewing needle. Then use very sharp, precise scissors to make the hole large enough to accommodate the grommet shaft. Next push the grommet from front to back through the hole. Last, use the grommet setting tool and a hammer to set your grommet. Cut 15" of wire. Thread through your grommet holes and turn up the ends. (You can also use the wire without the grommets - I've done that before too. If you feel like, you can tear off a scrap of coordinating fabric and tie it around your hanger. It looks cute and helps cover your closing stitches. If you decide to make one of these, I'd love to hear about it!